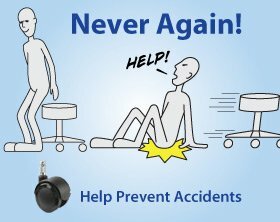 Drag-Brakeª Safety Casters Ever had a chair roll out from under you when you went to sit? Not anymore! Drag-Brake Casters give your free-rolling stool the control you need when you need it, so you wonÕt end up on the floor. The weight of the stool alone triggers the caster brakes, halting the stool and allowing the user to sit without it rolling away. Once you are on the stool, the caster brakes release and you can freely roll. These easy-install casters fit most common stools and chairs 2Ó-diam. Wheels ¥ 7/16Ó grip ring stem ¥ 7/8ÓL shaft ¥ Nylon construction ¥ 100-lb. capacity per caster ¥ Black ¥ CAUTION: Like any device, these casters must be used with caution. They provide an extra measure of safety, but user vigilance is always required.